Garrett Neese/Daily Mining Gazette A well testing kit is seen at the Western Upper Peninsula Health Department in Hancock. Results are processed within 24 hours. HANCOCK — Events such as the July 17 flood or the subsequent smaller rain events can harm water quality, making testing water sources important. The Western Upper Peninsula Health Department offered free well testing for areas affected by the flood. As of Tuesday, 462 wells had been tested, with 125 — about 27 percent — testing positive for contamination, said Tanya Rule, environmental health director for the health department. After a flood event, wells should be disinfected with bleach, then tested to make sure pathogens have been removed. The electrical system should also be inspected by a qualified electrician, well contractor or pump contractor once the flood has passed. For the general public, the WUPHD recommends testing wells for coliform bacteria on an annual basis. The testing kits are generally available at the WUPHD office in Hancock for $17. 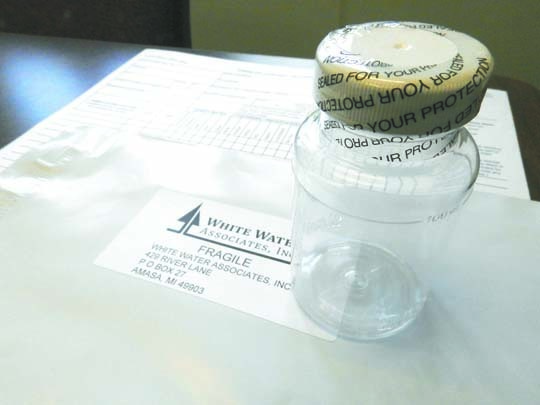 The tests are mailed to the White Water laboratory in Amasa, which returns results within 24 hours. “If they notice any water quality issue like unusual taste or odor, or if it’s cloudy, especially after a rain event, we always want people to test their wells,” Rule said. It’s also important to test if water systems have been depressurized after an outage or been dormant, Rule said. Coliform bacteria are frequently found in the intestines of warm-blooded animals. Their presence correlates to a greater likelihood of disease-causing organism. Symptoms of water-borne illness include gastrointestinal distress, abdominal cramping, stomach pains, diarrhea and vomiting, Rule said. Water is considered safe if two tests taken eight hours apart show coliform bacteria are not present, according to the Michigan Department of Environmental Quality. Municipal sources of water were unaffected after the flood. In the event people who need to boil or disinfect water, they should first check to see if it’s cloudy. If it is, they should filter it through clean cloths, or allow it to settle then draw off the clear water, according to a fact sheet on the WUPHD website. Boiling should be done at least for at least a minute, starting when the water comes to a boil. If bleach is used, residents should add one-eighth of a teaspoon, or eight drops, of liquid chlorine bleach per gallon of water. the mixture should be stirred vigorously and then allowed to sit for 30 minutes before use. With both methods, the water should be stored in a clean container with covers. An estimated 2 gallons a day should be prepared for each person for drinking, cooking and hygiene, according to the WUPHS. Contaminated water should not be used for food preparation, dishwashing, preparing baby formula, icemaking, hand-washing or other tasks.